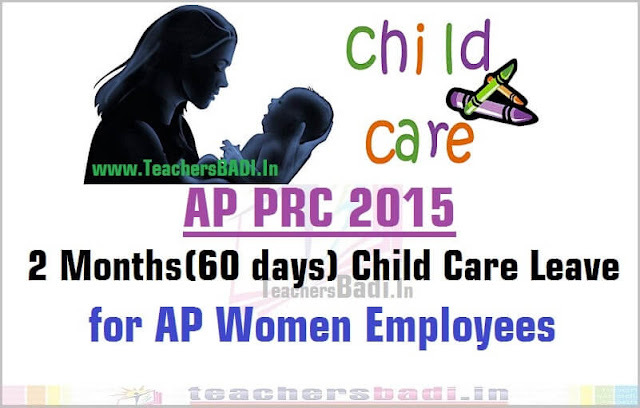 Child Care Leave Application Form, Child Care Leave 2 Months Application form, Child Care Leave 60 days for AP Women Employees-GO.132, Child Care Leave for two months to women employees, PRC GO.132. GO.Ms.No.132, Dated. 06.07.2016: Govt of AP, Public Services - Finance Department - Recommendations of Tenth Pay Revision Commission on Child Care Leave - Sanction of Child Care Leave for two months to the women employees of the State - Orders –Issued. Dated, Nil. 2. Representation of the Andhra Pradesh Secretariat Association dated, Nil. ORDER: In the references read above, the Associations requested for sanction of the Child Care leave to all women employees.